This Sunday, I am pleased to introduce to you Malathi Holla – international para athlete, Life enthusiast and perhaps the most resilient person on the planet! Humne Bhi, Tere Har Ek Gham Ko, Gale Se Lagaya Hai, Hai Na? Haven’t I embraced all the pain that you have sent my way? At 57, Malathi Holla epitomizes the spirit of Gulzar’s unputdownable lyrics and her Life itself, despite all the upheavals she has seen, is beautiful, harmonious and soulful – quite like the maestro Ilayaraja’s music for this song is, making his Bollywood debut memorable! Malathi was afflicted with polio when she was 14 months old. Additionally, she has a condition called contracture –where the nerves in her body get bunched up in a ball and have to be unknotted surgically. The effect of contracture, especially in the pelvic region, is very painful – the whole body curves up, like an arch, with the legs getting bent backward and the back moving forward. She has had 33 surgeries in all so far but she hardly displays any angst or bitterness. On the other hand, she oozes positivity and radiates happiness. This, despite the fact that she has had a forgettable childhood – her own mother, not knowing how to cope with the rigor of raising a special child, treated Malathi like an outsider. But Malathi ploughed on, burying her grief and choosing to be without resentment or malice. She trained, on her own steam, to become a champion athlete representing India in various international sporting events including the Paralympics – in 100 metres and 200 metres wheelchair racing and in discus, shot put and javelin throws – and winning 421 medals in all; 389 golds, 27 silvers and 5 bronzes! She was a senior manager with Syndicate Bank until recently and currently runs the Mathru Foundation, an NGO, that supports 13 children with special needs to get basic education and take up mainstream careers. 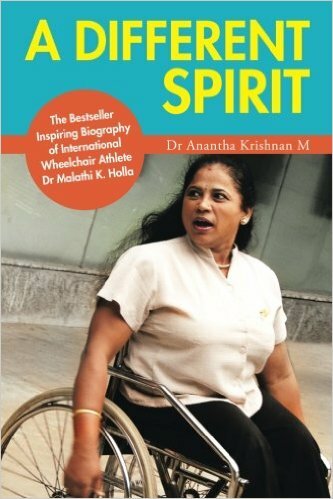 In 2009 a biography of Malathi – A Different Spirit, written by Dr.Anantha Krishnan – was released. I ask Malathi how is she able to stay anchored, positive and so outrageously happy – despite all that she is still going through? She tells us that anyone can be resilient. It is not a capability that only a chosen few can acquire. It is in you. You are resilient the moment you choose not be a slave of the circumstances. If you can be unmoved by what is happening to you, you can be strong in any situation. “Every problem has a solution. There are no problems without solutions. There is a way – you must look for it, that’s all. And in situations when I can’t find a solution, I simply accept whatever is the situation, condition or problem. This way I am perennially peaceful with myself and my world,” she explains. As I finish writing this piece, that number from Sadmais still humming in my head. 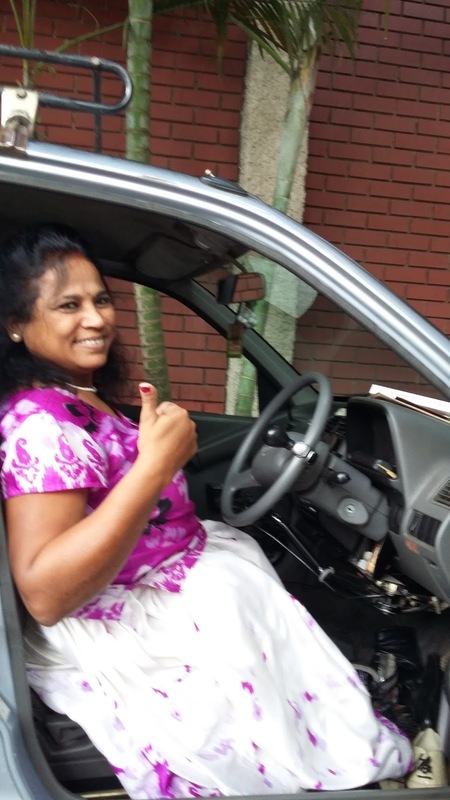 Malathi’s is indeed a different spirit – a spirit that we must all invite into our lives; to guide us too, to being happy despite our circumstances!